Cellulite treatment is a safe and effective cosmetic procedure that targets cellulite and fat deposits in the body. 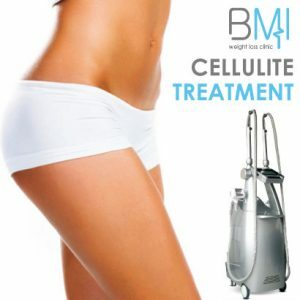 It is a non-surgical and non invasive way to get rid of stubborn fat and cellulite. This procedure was the first of its kind to be approved by the FDA (The US Food and Drug Administration) as a medical machine for circumferential and cellulite reduction. VelaShape, a cellulite treatment machine, is now widely used globally. It has become very popular as a non-surgical option to liposuction. Velashape treatment, a cellulite machine treatment – ultrasonic cavitation is a painless, non-invasive cosmetic procedure that combines vacuum technology, infrared technology and bi-polar radio frequency technology to reduce circumferential reduction and the visibility of cellulite. The ultrasonic cavitation technology massages, smoothens and manipulates the skin while radio frequency and infrared technology deliver heat to the fat cells and nearby tissues in the treatment area. While some people are able to see results after the first session of treatment, in most cases, the desired results are usually noticeable after three to six treatment sessions. After treatment, noticeable reduction in cellulite and circumference as well as a smoother and firmer skin is achieved. No one really knows the exact cause of cellulite. It is however linked to various factors including: unhealthy lifestyles, hormonal changes and genetics. VelaShape technology is safe on all skin types and has no side-effects. Therefore it can be used by anyone regardless of skin color or skin type. In most cases, treatment can be achieved after three to six sessions depending on the appearance of cellulite and the area being treated. Your cosmetic professional will be able to determine the optimal number of sessions for you. After a complete treatment, a circumferential reduction, noticeable reduction in cellulite and a firmer and smoother skin is expected. This varies between individuals. Normally, you will begin to see noticeable changes in the appearance of cellulite after three or more sessions. Some people report starting to see changes after a single session. Optimum results are usually clearly noticeable between the second and the third month. If you continue to follow a VelaShape treatment schedule, you will be able to maintain your results. But ultimately, the best way to enhance and maintain the results is to figure out a balanced dieting plan that works for you and a regular exercise schedule.